Does it really matter who found Titanic? Yes if you believe it was found before 1985. There have always been nagging claims that others found it, either private salvors or via classified naval operations. We know Ballard learned its approximate location during a classified naval operation involving the sunken U.S. submarine Scorpion. Ballard and the team got the credit in 1985 primarily because they could actually prove it. Claims that emerged fall into two distinct categories: (1) previous expeditions to locate Titanic that may have located the wreck; (2) classified U.S. or Royal Navy missions that may have located the wreck and kept secret for national security reasons. Paul Lee has a fascinating web page on the subject (http://www.paullee.com/titanic/titanicfound.html) and goes through the many threads this story takes. It is worth a read to understand why many claim Ballard was not the first one to locate Titanic. Is it possible that others located Titanic? Sure but without any real proof such as statements under oath and documents that can be verified, there is not much to back up many of the claims. Paul Lee notes recently of hydrographic studies done that may have found the wreck, though not necessarily knowing exactly what they found. A 1980 study appears have passed right over the wreck and may have located it. But there is no way to prove that right now. So we are left with some tantalizing possibilities but nothing that can definitively prove that Titanic was found prior to 1985. Many have heard the name Douglas Wooley. He is the British chap who claims to own Titanic (the wreck at any rate) and also argues for Titanic being found prior to 1985. He is now seeking investors to raise Titanic (and Queen Elizabeth I). You can get information at http://www.swsalvors.co.uk. The Plantation Historical Museum in Plantation, Florida will have a Titanic Exhibit from 14 April -30 Jun 2012. The grand opening and reception takes place on 14 April from 2:00-4:00 PM. A special presentation of A Night To Remember will take place from 5:30-8:30 PM. Admission is free. For more information about Plantation Historical Museum, go to http://www.plantation.org/Museum/index.html. David Quilter, the grandson of Lawrence Beesley, has been giving live performances of his grandfathers work The Loss of the SS Titanic. Those performances, in three parts, will begin showing on YouTube beginning on 10 April. For further information go to www.actor-davidquilter.co.uk . Titanic News Channel welcomes letters from readers. Please try to keep letters no longer than 150 words. Letters longer than that may be subject to editing. Please include your name (real, not email name), your phone number, and city of residence. You can send letters to editor@titanicnewschannel.com. April 14, 2012 is the 100th Anniversary of the sinking of the Titanic, and a lot of presumption as to why it sank is imposed on human error as if all these seemingly non-coincidental events, and sporadic instances occurred together to equal the solution to why it sank. So the story of events (not chronologically) goes like this: 1) Ignored warnings 2) Ship speed to meet the arrival time 3) Men on duty sleeping 4) Warnings not given to the captain 5) Steel rivets used in damaged area of ship 6) Iron rivets used on the rest of the ship 7) The navigation through (instead of around) the ice fields brought south by the Labrador current, (there are many other examples to follow). What if these are not coincidences (as I am suggesting), but a plan to assassinate the wealthy men who could stand in the way of getting the Federal Income Tax approved, and the Federal Reserve bank off the ground? In 1898 the novella by Morgan Robertson (1861-1915) entitled “The Wreck of the Titan” was published. There are many similarities between the fictional Titan and the Titanic. Aside from the names both ships were the largest liners of the time. Both didn’t have enough life boats, they were moving at speeds to fast for conditions, lost almost the same amount of people. The Titan had an unplanned meeting with an ice shelf. The Titanic had a planned docking with an ice shelf but hit an iceberg first. Could this novella have been the blue print for the men from Jekyll Island to carry out their evil plan to govern the world via a central bank? The construction of the Titanic started in 1909 funded by J.P. Morgan (a Jesuit who hand picked the captain of the Titanic, also a Jesuit (who was given last rites before sailing). Jesuits hide under the cloak of religion. It is interesting to point out that the Titanic was not christened (The word “christen” comes from English culture and isn’t properly defined in the modern day. It obviously derives from the word “Christ”, and means “to bring to Christ”). Could Cilia Thaxter’s poem “A Tryst” (1896) have been a precursor as well? Other names associated with supposed Titanic prophecy: W.T. Stead (who was on the Titanic), Mayn Clew Garnett, William Winthrop (writer, also on the Titanic). Some of the wealthy men on board like millionaire John Jacob Astor IV, Macy’s owner Isidor Strauss and industrialist Benjamin Guggenheim opposed a federal tax and a central bank because a central bank would of [and does] drop the value of the amassed wealth these men had accrued (let’s not forget that a federal tax is unjust weights and measures). (Earlier in history a debate between Alexander Hamilton and Thomas Jefferson over a centralized bank left Jefferson telling Hamilton that a centralized bank “would give the government too much power”). In the book “Bloodlines of the Illuminati” it is suggested that events like the Civil War, Kennedy’s assassination and the Titanic sinking were mere Illuminati family feuds carried out on a grand stage. For all the world to see, and to hide the crimes in plain sight. The Illuminati like to hide there tracks by throwing their blood money into bribery for willing stooges (the Illuminati have even hired The Mob for dirty work). It has been suggested that the Illuminati paid Spain to supply Nazi Germany with oil to keep the war effort going. Even today we see the Lee (Li) family infiltrating Hollywood. Were Bruce and Brandon Lee’s deaths accidents or premeditated murder? The book “Creature from Jekyll Island” deals with the secret 1910 meeting of Illuminati delegates, and the birth of the federal income tax and Federal Reserve Bank (which operates in fiat money (which means they make money off of the honest taxpayer’s money). If every citizen were to withdraw all their money at once the Federal Reserve would collapse. In an article dated February 9, 1935 Frank Vanderlip (In Dutch means “from the lip”) (Does God have a sense of humor or what?) spilled the beans in the Saturday Evening Post of the proceedings at Jekyll Island, Georgia. How they used code names, private cars and separate travel arrangements were made to maintain secrecy. It is also interesting to note that the game Monopoly went of sale in 1935 (notice the dates). The game’s premise is to monopolize your opponent. Could this have been a panoramic evasion technique to cover up, or to hide in plain sight the proceedings of an Illuminati monopoly (with respects to the Federal Reserve)? (Pun intended). It is also interesting that J.P. Morgan died in 1913 the year the Federal Income tax became effective, and the Federal Reserve was established. 1913 is a year after Titanic sank. John D. Rockefeller founds Rockefeller Institute and donates $100 million dollars as initial grant. In 2001 The Rockefellers donates $40 million (plus) to new era teaching, and inner city projects after the 9/11 disaster. Are these coincidences or comprehensive plans being unveiled? I believe it is the Illuminati economy (how things work together) and the panoramic picture that we need to peer into. The reason for our current financial economic woes is (generally put) the Federal Reserve’s lack of concern for the gold standard, and the unconstitutional issuance of paper money (Article 1, section 10) another way to make greed palatable. The Federal Reserve System is said to be unsinkable. It is interesting to note that the Titanic was supposed to be unsinkable. There was a tale told in a sermon of a welder who worked on the construction of the ship etching in one of the steel plates “I defy God to sink this ship”. One of the welder’s work mate’s was very nervous of the challenge leveled to God, a challenge that proved to be founded. They were many sermons given (as you can imagine) about this disaster being God’s judgment on man’s pride. While I believe that God’s hand was in it, the evil men who constructed this event, were not compelled, but operated of their own volition (Acts 2:23). Rowland is a character in “The Wreck of the Titan”. In the novella his character was assassinated by others. They said he had kidnapped Myra (when in truth he rescued Myra (after the Titan had hit an ice shelf head on), and saved her from a polar bear (among other obstacles and trials), and returned her to her frantically awaiting parents. I mentioned this excerpt because that is what evil does. It twists the truth to harm the innocent. How many innocent were on board the Titanic? In Halifax, Nova Scotia where many victims are memorialized. The passengers are listed not by financial status, class seating, by age (oldest to youngest) or by destination, but by SAVED or LOST, which is precisely how God looks at us. Now I saved the best evidence for last. The Titanic officially sank at 2:20 A.M. on April 15th, 1912. What is the deadline for our current Federal Income tax? April 15th. Tell me that these crooks are not hiding in plain sight? After 100 years we may have to wipe away the dust or even break out the baking soda and hot water to clean away the years of corruption. I posed a theory to my Face book congregation, with many interesting comments. One stands out. “How did they get the iceberg to cooperate?” What people don’t seem to reconcile here is that the captain was heading right into danger according to some Jesuit devotion to a Kamikaze agenda. This was a mass assassination success. The propaganda did its job by getting people to think these are random acts, and there was no intentional crime being committed in plain sight. I think an excerpt from Carl Sandberg’s poem “The People Yes” answers that (as well as the smugness of the Illuminati machine). 1) Julian Fellowes, who has penned a new Titanic miniseries for BBC, has decided to call out James Cameron for making William Murdoch a coward in his movie. Fellowes is late to the party. Murdoch’s family and many in the Titanic community were outraged at the depiction resulting in an apology. So why do it now? Well of course to drum up interest in his upcoming miniseries. “I don’t think you can take someone who was moral and decent and make them do something immoral and indecent,” says Fellowes in the interview. He then goes on to say that while Murdoch is depicted with a gun, that the record is set straight. Good to know but Titanic historians are going to be looking at a lot more than that when they judge whether his miniseries is good, okay, or bad history. 2) Meghan Cox Gurdon offered up some Titanic books for kids in a recent Wall Street Journal column. She offers up some excellent choices for parents to consider. Often we forget that there are good Titanic books for kids and not that hard to find. 3) You can view many of the Titanic artifacts up for auction by visiting this link . With so many events commemorating Titanic coming on, one has to be creative to get noticed. Groupon decided to go beyond the exhibits and dinners and offer a trip to the wreck fo $12,500, 79% off the full charge of $59,680. In case you have forgotten, the actual trip requires heading out to sea where you will take a 10 hour dive down to the wreck in a small submersible. Is it worth it? You decide. But Deep Ocean Expeditions states that this is the final year they will offer these trips. An upcoming Glenrothes exhibition that will focus on Titanic (focusing on the Countess of Rothes) got an interesting surprise. A donor found a real Titanic 12 piece dinner service. Not a replica but the real thing from 1912. At first he wanted to donate it but was shown its true value (£4,500). Now it will be shown and then placed in a vault for protection. The Belfast Telegraph is reporting that 80,000 tickets sold for the upcoming Titanic Exhibition. This is welcome news, the Telegraph reports, since it cost £90 million to build Titanic Centre. Yesterday it was reported that the original Simpson letter is being returned to Belfast. This is good news. While the identity of the benefactor is not known, Titanic enthusiasts ought to cheer. And on St. Patrick’s day offer up a drink of thanks as well. Earlier this month a letter was put up for auction in New York. The letter written by Belfast doctor John Edward Simpson aboard Titanic and mailed in Cobh, was thought to fetch $34,000 (£21,692). It failed to reach that reserve price but an anonymous benefactor has purchased the letter and is sending to Belfast. Although copies abound, this is the original. Needless to say the Simpson family is quite pleased. You can view the BBC video here. Cheryl DelVecchio, the Children’s Librarian at Fairfield Woods Branch Library, came up with the idea of workshops focused on Titanic. One of the recent ones involved the kids building mini-replicas of Titanic using construction paper, milk cartons and glue. According to Ct Post, the models “included smokestacks and could be adorned with accessories like waves and sea creature stickers. Children and adult companions collaborated on the work, trimming, taping and decorating the small ships.” From the pictures it looked like the kids had a grand time working on the project. Sometimes it is the simple things that tell the story much better than all the expensive glitter and pomp. The Daily Telegraph reports that a previously unseen account by a survivor alleges Captain Smith was drinking before Titanic hit the iceberg. Second class passenger Emily Richard’s claims in a letter (written aboard Carpathia) that Smith was in the saloon drinking before he went to bed. Most accounts have Smith retiring to his cabin after leaving Murdoch in charge and in bed when the collision occurred. Una Reilly of the Belfast Titanic Society was asked about the claim and states to have never heard the accusation before. The problem is that no one else can corroborate this story. And it is quite possible it is a case of mistaken identity. No doubt it will get some play as the story zings around the world. Of course various Titanic authorities will be called or asked to comment. Coupled with stories about drunks piloting boats, the news media might wring out even more stories. So where does this story go? It gets filed into those strange/odd stories that seem to come out around full moons, Halloween, or near anniversaries of important events like when Titanic sank. With a $10 face value, the 99.99% pure silver coin features a design by maritime artist Yves Bérubé of the ship under full steam as it nears the iceberg which would seal its fate. The proof finish of the coin shows off the longitude and latitude of its final resting place off Canada’s Atlantic Coast in a delicately frosted highlight. This finely crafted coin, equally suited to Titanic buffs, history enthusiasts, and collectors is limited to a mintage of 20,000 coins world-wide and is available for $64.95 CDN. A silver-plated 50-cent coin offers a second Yves Bérubé perspective of RMS Titanic. The frosted detail of the colossal vessel’s bow and the gigantic iceberg lurking ahead are frozen in time on a proof coin which captures the two principal actors in the real-life drama of the RMS Titanic sinking. The selectively coloured waters of the North Atlantic seem to shimmer and flow in the doomed ship’s wake. Limited to a world-wide mintage of 15,000 silver-plated copper coins, this dramatic keepsake retails for $34.95 CDN. A richly coloured 25-cent cupro-nickel coin completes the Mint’s account of the unforgettable story of RMS Titanic. Designed by Three Degrees Creative Group, the coin shows contrasting views of the RMS Titanic casting off on its maiden voyage before admiring crowds in Southampton, UK. This image is juxtaposed against a shimmering scene of the floating palace gliding through North Atlantic waters under a starry night sky. These haunting images are framed by two columns of four circles rising out from opposing sides of the coin’s edge. These impressions symbolize the more than three million rivets which fastened the ship’s hull. 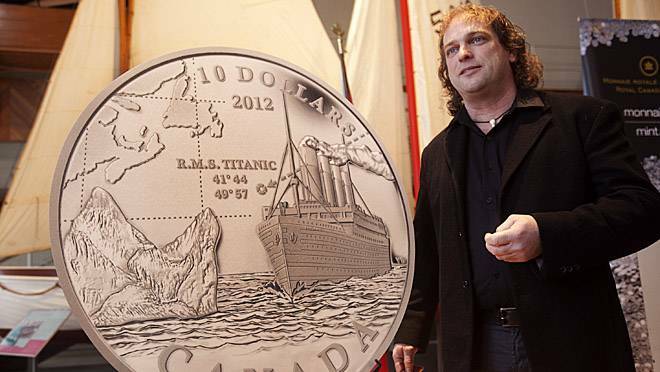 The coin is packaged in a colourful folder containing a pop-out bird’s eye view of RMS Titanic sailing in all its glory, as well as facts about the ship and a timeline of her maiden voyage. Produced on demand, this captivating coin retails for $25.95 CDN. You can go to Royal Canadian Mint website at www.mint.ca to view the coins or place an order.